Backpaddock lakes was built about 20minutes away from where i live. A family friend, George Williams, up our road has a bout and knew how to barefoot. He offered to take me down and teach me how to barefoot. i was taught the basics from George Williams off a home made bar. 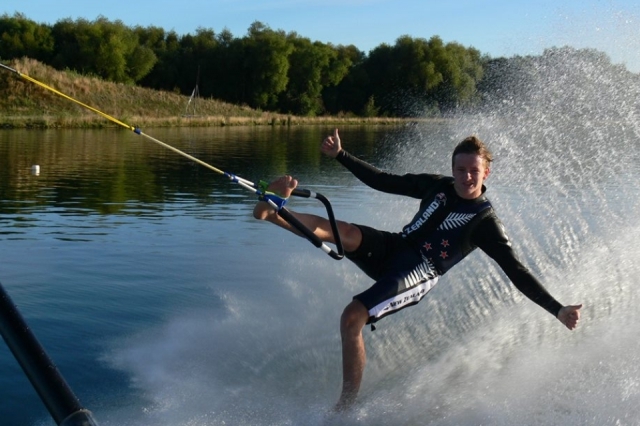 i then learnt how to long line barefoot using a wake skate to get started. George Williams taught me the basics of how to get up and ski on the bar. from then on we both experimented with tricks like one foots and tumble turns. he learnt how to barefoot by just getting up and doing it with no prior training. he was amazed at how easily i got it and after the first time bare footing i knew i wanted to continue on with the sport. My first tournament was at the Bay of Plenty regionals in 2012. i scored 5.1 in slalom and 500 in tricks. i came 2nd in slalom, 3rd in tricks and 3rd overall. The first time i ever stood up and felt the water on my feet, i knew that i wanted to continue on with the sport. Nothing else gives that feeling of being able to walk on water like bare footing, it is an amazing feeling having nothing between your feet and the water. I also really enjoy the bum slide at the end of each run, being able to sit on the water with nothing pulling you, being able to touch the water with both hands and glide. i still look forward to this feeling today and it is one thing that helps me get through each run without falling. one of the main people that have inspired me is Keith St Onge. after reading his book and understanding his life up to this point and knowing that he has put huge amounts of effort into becoming one of the best barefooted to date, has really steered me in the same direction. after meeting him at the 2014 world championships i got the impression that he is a great all rounded man and that he is an inspiration to look up to, not only on the water but life in general. i also look up to David Small and his amazing ability to jump great distances and trick and slalom at one of the best levels. Ben Groen is also one the people i look up to as he is a New Zealander and with the time in which he has coached me, i have learnt many things which have improved my overall skiing. Keith, Dave and Ben all make completing the hardest tricks and performing the best techniques in all three events so easy. i have enjoyed watching videos of them making surface turns look so easy and landing jumps over the 25 meter mark with ease. I am amazed at their abilities on the water and enjoy keeping an eye on their videos. i try to ski at least 3 times a week at Backpaddock Lakes. i will go and ski until i can't stand up on the water. not having the luxuries of owning our on boat has made this quite difficult, but George Williams has been a huge help letting us have access to the boat whenever. i have often been going down to Rob Groens at Lake Inspiration for the whole weekend and getting as much skiing in as possible. I play school soccer and attempt to ski as much as possible during the winter and compete in slalom skiing and wake boarding events which are held at Backpadock lakes, i also play cricket with my brothers during the sumer whenever they are short of players.